The Park Inn Prague provides 210 modern and beautifully restored guest rooms, all faithfully designed to follow the Park Inn design standard. Hotel Park Inn offers an accommodation featuring first-class amenities like high-speed Internet access, hair dryer, mini bar and individual climate control. State-of-the-art fitness centre including a sauna, restaurant with a bar, hotel restaurant where guests can enjoy both international and local specialities. Underground parking is available. 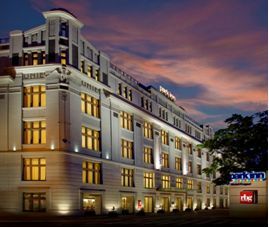 Hotel Park Inn Prague is centrally located nearby various attractions in the city and steps away from Vysehrad Castle and the Vltava River. 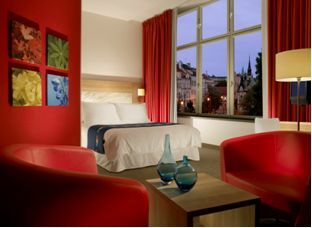 From the hotel Park Inn there is an easy access to various Prague attractions like Charles Bridge, Old Town Square etc. by trams 3 or 17. Morning transfer to the Prague Congress Centre will be provided during the official event days (the journey should take up to 5 minutes). By public transportation: From tram stop Výtoň situated 3 minutes walk away from the hotel take a tram No.3, 7 or 17 and go 1 stop to the tram stop Palackého náměstí, change to tram No.10 or 16 and go 3 stops to I.P.Pavlova. There change to metro (line C) and continue 1 stop to Vyšehrad. Congress Centre is located next to the metro station. The journey should take up to 20 minutes.